In case you missed it, this morning we revealed the results from our most recent survey on the confirmation hearing for the next VA Secretary. Thousands of IAVA members from around the country sounded off; and while we’ve already shared the top lines far and wide, we also want to share all the thoughtful and impactful comments and questions our members had for the nominee. What is the most important quality (or qualities) in a VA Secretary? Respondents that selected “Other” were able to write in their responses. This is a visual representation of those responses. What are the most important issues facing the next VA Secretary? What question(s) do you hope to see asked of the nominee during his confirmation hearing? It would be good to hear his opinion on Veterans health care and if he supports Choice. I would like to see him asked to detail his plan to manage a bureaucratic organization as large as the VA, as well as what experience he has in management in the past that would prepare him for this role. The fundamental problem with the VA appears to be its culture. Leadership does not reinforce an ethos of accountability and rank-and-file bureaucrats do not appear willing to own their job responsibilities. What specific plan are you considering to address this systemic issue once and for all? If you do not have such a plan formulated, do you recognize the need for such a plan, and when (specific date) should we (Congress) expect you to submit that plan for our review? Will you commit to resisting privatization of the VA? Will you commit to listen and respond quickly to Veteran Service Organizations requests and demands on health care policy? Will you support the removal of prohibitions and sanctions in the VA system against Veterans who use cannabis as an alternative to pills? Will you update the VA’s system including technology, software, and interfaces, working with developing tech to create more secure- and more user friendly- VA databases and client interaction sites? Will you ensure that the VA has enough people on staff in all its Hospitals and Outpatient clinics to adequately treat in reasonable times all those eligible to receive treatment? Will you commit to ensuring that the service-connection disability claim process is advanced in both technology and understanding, and will no longer be a system of barriers to veterans but a guided system that correctly identifies if an injury is service-connected in a swift and accurate manner? What are your thoughts about restoring “gap pay” for those on VA educational benefits to receive a stipend while in between semesters? What would the VA do under your leadership to ensure that toxic exposure to our troops both at home and in the Gulf War and Iraq and Afghanistan Wars (maybe Syria too, soon?) does not become my generations’ Agent Orange, while working to more quickly study, address, and mitigate the continuing effects of Agent Orange on our Korean and Vietnam era veterans? In light of the number of empty or acting roles in VA leadership, what is his vision for creating more effective and more transparent leadership and eliminating the already toxic environment created by previous and current leaders and what is the new role for the Veterans in all this how should they change the way they see the VA? What specific experience do you have that would qualify you to be a hands-on, all-aspects administrator of what is arguably the largest federal bureaucracy in the federal government? What specific experience do you have that would qualify you to formulate, oversee, and execute a budget equivalent to that of the Department of Veterans Affairs? Are you prepared to confront the President in defense and protection of all Veterans benefits if necessary? How does his limited management experience qualify him to take on a bureau as huge and complex as the VA? How does he propose to streamline the claim process. Veterans wait too long for decisions. What skills and experiences do you have that make you qualified for the position of VA Secretary? How can veterans be assured you intend to serve and support them independently of this political administration or climate? Will he keep the VA open to ALL veterans? How is [the nominee] committed to changing how the VA is currently operating in order to ensure Veterans are receiving timely and effective communication regarding any and all benefits? What is he plan to ensure mental health is addressed in order to eliminate 22 Veteran suicides daily?Can you explain what aspects of your background qualify you to bring a large, awkward (but vitally important) government bureau into the 21st century? Are you willing to commit to negotiate for large amounts of money to allocated for veteran psychiatric health, in order to prevent the extraordinary high rate of suicide and homelessness? In my experience, the VA is a broken and inefficient system that benefits no one. Providers are unable to provide quality care due to their impossibly large caseloads, and patients are often made to feel dismissed, like a number, and given few if any options for alternatives to medications. What will you do to fix this broken system, to support providers and ensure veterans are receiving the quality care they deserve? Will you support alternative modalities, so veterans have choices? Will you totally oppose move to privatize VA medical? How are you going to stop privatizers in current administration? What’s the biggest accomplishment you hope to achieve? How does he plan to establish and implement the policies and procedures necessary to restore internal and external trust in the VA and provide required services to veterans? How to make the VA more responsive to the needs of Veterans, both Medical and Behavioral. If confirmed, what is your strategy to improve access to the VA – and define “improve access” – and to reduce post-service self harm? And what will you do in the first 90 days to implement your strategy? Sir, what is your overall plan to reorganize the VA, so that it will better serve those veterans with service connected disabilities who are committing suicide daily? Giving specific examples, what steps are you going to take to better the VA? If the needs of the VA and the veterans that it serves run contrary to the will of the president, whom will you serve? What is he is going to do to drain the VA swamp? How likely to support cannabis for veterans want to use it? Is he committed to help veterans? How do you plan to strengthen the system of education and job training opportunities for Veterans and military families? Will you take action to curb waste and abuse by predatory private companies (both education and health care) who scam and take advantage of Veterans? What are his plans to fully staff and all VA hospitals and clinics to ensure that vets are seen in a timely manner for all of their health care needs? What is the most facilities / people (mil and civilians) and dollars he has lead at anyone time in his career? Will he do what is right for Veterans or what the President feels is right for Veterans? Are you a proponent of privatizing the VA? If so why? What research have you reviewed that demonstrates this is a viable option that will benefit Vets? How to fix VA choice so the private sector will participate & embrace it. How to revitalize VHA to make it the premier healthcare choice for veterans. Do you fully support existing VA, and fully fund VA? Will you hire staff to fill existing needs.? Will you support a Geriatric specialty staff for older vets.? What steps should the VA take to ensure all veterans are automatically enrolled for VA services? How strong is your commitment to prevent privatization of the VA? How will you manage this large, complex bureaucracy and organizational structure? Please describe in detail the three largest weaknesses that you recognize, and what are plans to mitigate these weaknesses? What does Dr. Ronny Jackson think about privatization of VA service delivery? How does he feel about privatizing the VA versus keeping it part of the Federal Government? What are his top 3 priorities for the VA if he were be confirmed? What process will he put in place to hear the concerns of those impacted by current conditions and the changes they feel necessary as part of his decisions and implementation of any changes he will enact? Aside from being appointed to this position, is this a position you would have sought otherwise, and what changes do you plan to implement to possibly allow USPHS Nurse, Medical PA, NP officers to serve with the VA? How will you secure appropriate funding for the VA’s continued transformation? What are your detailed opinions about the privatization of the VA? How will you help VA patients be in control of their health care? How will you address the needs of veterans in rural areas? His experience running a large governmental agency and his previous healthcare work with Veterans. What will you do differently than GEN Shinseki’s administration and all the subsequent administrations to bring the VA into 21st century capabilities? Veterans need proper reentry after facing combat. The psychology of leaving a team and the adrenaline, and returning home to what seems less important, less exciting. How to find a new belonging and balance? Do you support or oppose VHA privatization? If you support privatization (at least in part), which services would you privatize and which would you retain within the VHA? Will he be an advocate for the vets and not the President? What skills do you have to manage the VA with goals of improving services to veterans, including prompt resolution of claims for benefits? What specific knowledge, skills, and abilities did past VA Secretaries have that you think led to their successes and which specific weaknesses led to their failures? Limit answer to the past three Secretaries. With his background experience, what exactly will he focus on in improving the overall quality of care at the VA.
How does he feel about Veterans care being outsourced to the private sector? In your opinion, what is the greatest concern facing our military veterans present and future? With only small unit leadership experience, will the nominee lean heavily on the current VA administration that has proven to be inefficient? Change begins at the top but, with an apathetic ladder of leadership, will he ensure positive change is carried out at all levels? Why does he think he has the background to actually manage the VA? Why does he think he qualifies for the position? How do you plan to learn a massive nation-wide health care system, which takes career employees decades to fully understand, fast enough to implement any significant changes to the way the VA health care system is run? What experience do you have that qualifies you to manage – let alone fix – the Department of Veterans Affairs? What would you to do to ensure that veterans receive the care that they deserve? How does a grateful nation forget about its duty to its warriors when they’re wounded and at home? How do you address that memory loss? What would you do to clean house? And how would you recruit highly qualified medical personnel to the VA? How do you relate to civilian personnel – who are largely responsible for veterans’ care? Can you straighten out the V.A.? How would you structure the VA to meet the growing needs of all veterans? Will you prevent any and all efforts to privatize VA Health care? How he is going to solve the problems at the VA, that have taken place for all of these years? Will he treat all men and women who come back to the US as if they were is own? What steps will he take to block the privatization of VA health care? In regions where medical and recreational marijuana has been legalized, there has been a steep decline in opioid use. Will you continue the reduction of opioids in the VA with the inclusion of cannabis products in VA health care? How do you plan to stop the mistreatment of veterans in the va health care/ treatment facilities? How does his experience as a physician correlate to running such a large group of vets with a wide range of complications and issues? I would like to know how the nominee is any different from his predecessors? What is the largest team that you have led? What will he do to improve healthcare at VA facilities? We are in need of more qualified physicians in specialty care. Reduce percentage of trainees and increase certified surgeons to perform surgeries? Do you consider the integrative approach of providing healthcare to wounded soldiers important? What will the nominee do to ensure every veteran is getting the help they need? Is he planning on seeking other venues to privatize the VA system? What steps will he take to improve the system in general and will he work in every veterans best interest? How does he intend to manage 320,000 public sector employees with no experience leading a large organization? What is his stance on privatization? What are his specific plans to improve the VA image with not only all Veterans but the American public? Do you support providing access to private doctors? What experiences do you bring to the table to improve the lives of veterans and what are your specific plans to fix the VA? Why are veterans issues still not taken serious by the government? All over the world veterans are treated with respect and dignity, why is it not the case in our country? Are you in favor of opposition of privatization of the VA? We are worried that maybe you want the VA to go private? How do you plan on achieving measurable success in improving the delivery of effective VA services to qualified recipients, and what do you need from Congress to make that happen? What is your overall plan for the VA? What is his first priority? What experience other than direct primary health care do you bring to the enormous organization of the VA, since health care is only ONE element? What is the largest group of people you have ever lead? What is your motivation for wanting this daunting position? What have you contributed to the Navy that was outside of what was asked or required for personal or professional benefit? Is he opposed privatization efforts, except when absolutely necessary? How will you manage cost with access and with compassion to eligible VA benefits; will you consider partnerships with corporations / systems managing with success the same issues? I would like to hear the nominee address the ongoing issues surrounding that lack of accountability to any oversight entity that is currently in place. What experience does he have that would qualify him to run the second largest federal department? How does he plan to improve VA medical care? What is his stance on the privatization of the VA? What new technologies/therapies is he willing to use to bring positive results for those veterans who require them? For the Gulf War Veterans – what new technologies will be used to get to the bottom of why so many are sick? For the OEF/OIF Veterans – What new info can you provide on the Airborne Hazards/Open Burn Pit issues? And do YOU envision the VA doctors who will end up treating them – a series of briefings – so much so – that they understand that this issue is 21st Century’s version of Agent Orange? What skills can you bring to running the VA? If you are confirmed who will fill the top level positions underneath you and how will these people be selected? How do you plan to downsize the VA Bureaucracy? How do you plan to improve VA mental health care; and rapidly reduce the veteran suicide rate? How do you plan to continue to further reduce the VA claims backlog? What are his priorities for Veterans? What is going to be done about bills Veterans are receiving from the VA Choice program and the slow paying of bills and credit agencies threats? What is your position on the privatization of the VA system? List 3 things you see as a pro and con for the privatization of the VA system? What do you and your staff plan to do; to recruit and retain veterans for employment with the Department of Veterans Affairs? How do you plan to handle the “VA Accountability Act of 2015” and the lack of due process for the federal employee? What procedures will require be put in place to shorten appeal hearing decision timelines? -improve the services that the VA provides for military sexual trauma victims. -I’d like to see a breakdown of expenditures by the VA, and also know how he is going to hold medical staff accountable for preventable deaths. -what policies will he enact to improve patient verification and stop wrong medications being sent to veterans, and harmful vial and sterilization practices. -I would also like to hear about his views on whether or not dishonorably discharged combat veterans will receive the opportunity to update their discharge status. What experience have you had in your past that would qualify you for this experience? What do you believe is the first item you plan to address if selected? What are his plans for the future of the VA, including plans to upgrade treatment of women, plans to bring the record-keeping aspects into the 21st century; managing/reducing current suicidality & drug misuse goals of eliminating veterans’ homelessness? In your mind, what are your qualifications to oversee one of the largest agencies in the United State government, and why do you think that? How are you going to deal with the time that veterans have to wait in order to get appointments inside the VA and in the Choice program? What role does he see the private sector having in providing services to veterans? Does he support privatization of the VA Health Care System? Why do you think you are able, as a military doctor, to run and fix one of the largest be bureaucratic offices in the US government? How will he handle a claims process that is still slow and improve veteran healthcare? What is your background in managing large, complex organizations, especially those providing medical services? Did you serve anywhere near the front lines or were you in a nice safe and clean hospital somewhere? Will you protect and defend the VA from the push to privatize it? Will you continue the progress that your predecessor started without White House interference? How his money management experience relates to support all of the services under control. How does he plan to fix the backlog and the fact that many veterans still don’t have an assigned primary care physician? What large scale change have you been responsible for in a large bureaucracy? How have the VA helped him achieve and maintain his health? What can he do different than his predecessors? How long will it take to determine if actions are prompting positive results? Can he master the necessary bureaucracy and quickly appoint a strong effective team? Do you have the experience to efficiently and effectively run the VA? How will you reform and streamline the bureaucracy at the VA which impedes the treatment of America’s veterans? How will they address mental health issues facing veterans and how can we ensure vets are seen in due time and frequency? What will you do to get rid of dangerous medical staff? Will you eliminate the adversarial environment towards Veterans? Why do you think you are qualified to run the VA and be the voice of veterans within the USG? Will you privatize the VA as the plan set forth by President Trump? What do you feel makes you qualified for the position? How will we improve access to care for veterans? My brother, who suffers from severe PTSD, waited 7 hours at the Hampton VA, despite having an appointment, to see a psychiatrist. Totally unacceptable. How will he fix this? What is your stance regarding Agent Orange and to those suffering from exposure, past, present and future? 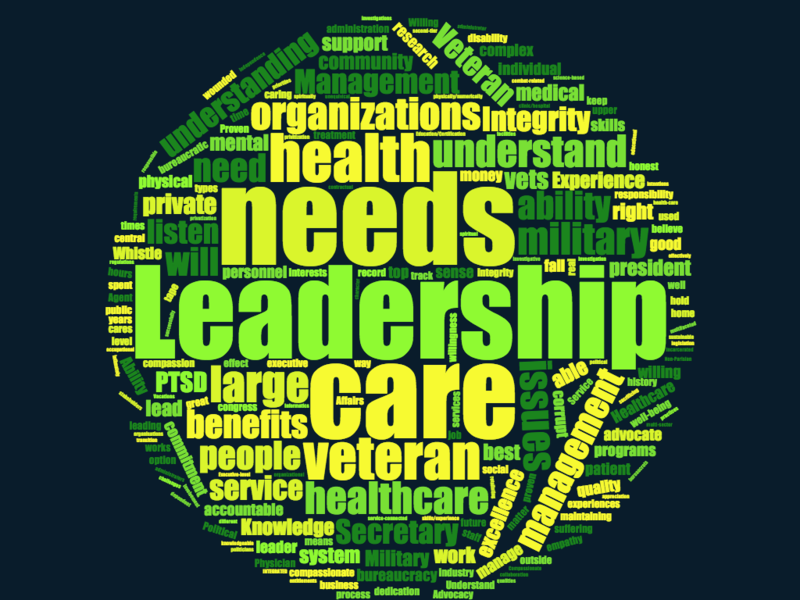 What management leadership positions have you had that will assist you in steering the VA? What experience does he have that makes him think he can run the VA successfully? What is his stance on cannabis meds without THC? What will he do about suicide rates? Why, or do you believe you have the experience necessary to run the VA? Questions about his experience managing a large organization. What would be the keystone for his reformation of the VA? What kind of help he can have to achieve veteran issues? What aspect of your career in the Navy best qualifies you to hold this position? How do you intend to integrate yourself into the Department so as to understand the complexities required to remove inertia inhibitors to care? How long do you forecast the integration period will be? What is his plan to fix the failures of past VA Secretaries moving forward? o you feel that you can adequately represent the affairs of Veterans, manage the VA, and advocate for Veterans issues given your military experience? What makes you think that you are qualified to be VA Secretary? What will you, as Secretary of VA, do to ensure abuse of the VA system is curtailed? Will you give Veterans true choice of care? Questions pertained to experience and reform ideas for the VA and care for rural American Indian veterans. How do you expect to oversee the functioning of the V.A. since you have no experience running any bureaucracy of any size? Are you going to try to privatize the VA system? How will he enforce accountability within the organization while providing the best services to veterans? How does your background prepare you to manage and oversee a bureaucracy of 300,000 people? How does being the personal doctor to three Presidents qualify you for the job of running the VA? Will he do his best for veterans? Is he in favor of privatizing the VA? How do you think your professional experience has prepared you to manage the expansive bureaucracy of the VA? What experience qualify him to oversee the largest healthcare system in the country? Will you get medical marijuana access to our vets? Why or why not? What is he going to do to bring more veterans into the programs that purposefully stayed away due to the past history of the VA? What is he going to do to make the VA better? Where will the VA be in 2020? What role do you see the private sector playing in veteran care? What is the largest number of staff that he’s overseen/supervised at one time? What are his plans to make the VA responsive to Veterans’ needs in a timely fashion? Will he put the interests of the Veterans above any political agenda pushed by the Administration? What would he do if he received a direct order from the President/Administration that was contradictory to the VA’s mission and values? How are you going to change the VA’s Culture to one of Innovation and Collaboration? What administrative healthcare experience does he have? Has he ever ran a hospital or been the Chief Of Staff at one? What are his positions on veterans issues? What ideas does he have to improve the system? Would you hire a former patient from VA hospital to help with changes in the future? Does he support Military benefits for members who haven’t deployed in their time of service? Do you think you have the experience necessary to run the VA ? How will you aid in Women’s Veterans programs and increase their enrollment numbers and increase access to women providers to aid in women veterans that deal with MST to be more at ease in using the VA for their healthcare? 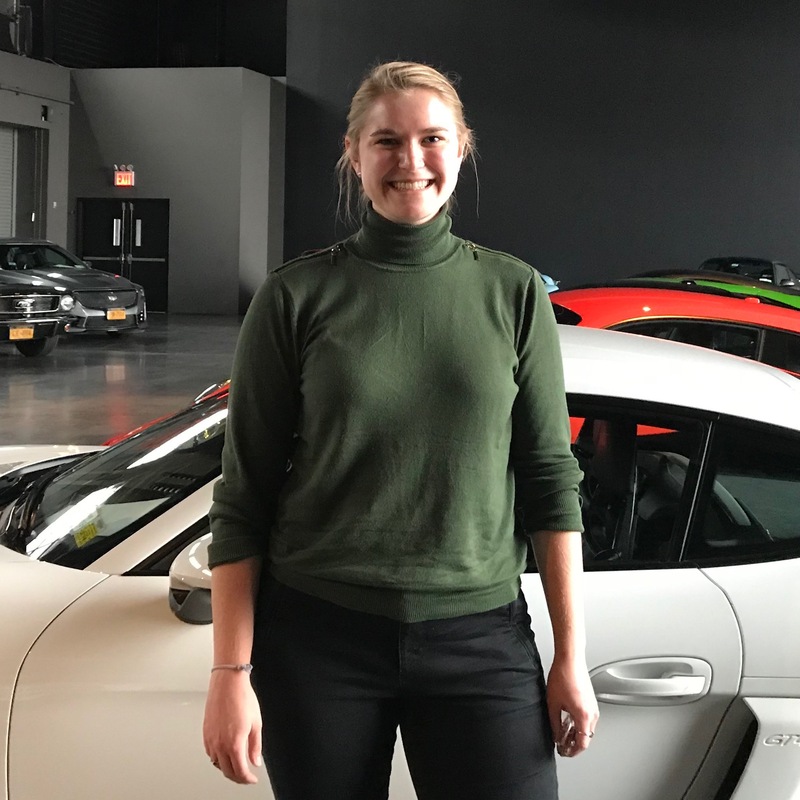 What are your qualifications to run an operation as big as the company GM? Questions regarding cutting VA regulations/policies and allowing doctors and patients to determine needed medical care. Will he support education, mental health, defend all military benefits. How are you going to fix the problem of wait times for appoints? What steps will the nominee take to ensure that VHA is competitive with private hospitals without privatizing the VHA itself? With no apparent financial or business experience, how does Dr. Jackson plan to ensure the VBA runs smoothly and doesn’t get lost in the issues surrounding VHA? Currently, there is a negative climate towards VA employees, most of which are hard workers who care deeply about the Veterans they serve; what does he plan to do to defend these employees and the sites that are completing the VA’s mission without controversy? What can a person with a little admin. experience bring to the Department of VA? What part of your experience makes you the most qualified to effectively manage such a diverse organization? What is his plan? What leadership does he need to execute his plan? What is your management experience that qualifies you reform a bulky, large organization that is frozen by ancient congressional mandates and employees ossified by decades fear-driven management? What is your view of the unending wars in which our services are engaged, and the continuous deployments.? Who has he discussed privatization of VA health care with? Has he met and briefed the VSO’s on how he thinks the VA should be managed and has he asked them what they think are the top two problems? Will you put veteran health above politics, the White House, and the Legislature? As a veteran, what do you expect from the VA and how will you make that a reality? What is his stance on privatization of care to veterans? What he will do for veterans, why he should be in that role, how he will protect veterans’ benefits? What exactly are his plans for the VA? Concrete answers please, no vague answers. How will he streamline the VA to better serve veterans? How do you plan to connect VA to the local community for services such as jobs, education, and supportive health care beyond what the VA offers now? What is the role of the VA with Medical Schools? What is the role of VA Research with the world body of knowledge in health care? How does his experience would prepare him for leading the large bureaucracy that is the VA? When will our retired National Guard members have the same rights as regular military retirees? How do you plan to improve suicide prevention, especially for those who don’t live near VA facilities? What reforms does he plan that will have the most impact making today’s veterans lives better? What qualifies you to lead an organization of this size & importance? What would be your primary short-term & long-term goals? What do you believe is the biggest challenge for the VA moving forward? What do you believe will be “your” biggest challenge? What is the plan to address the medical care current veteran pollution from Iraq and Afghanistan? How will the VA environment change under his leadership? Will VA physicians be held accountable for not providing care? How will you reform how money is spent inside the VA? How will he fill all of the clinical positions that have been open for years? How will he increase access to care? What are your thoughts on partisan groups backed by monied special interests pushing for privatization of the VA? Will you need the calls of veterans who soundly reject privatization? How he will bring accountability and reform to the VA? What his plans are to reduce fraud, waste, and abuse to increase financial stability and proper use of funding? How he will increase patient access to doctors with all the additional new veterans entering the system? Please explain what experience you have that qualifies you for this position? What is your plan to weed out the toxic employees and hold accountable the rest for doing their jobs in a friendly and efficient manner? “What is your vision for the VA and the care and benefits for veterans and their families moving forward? How do you intend to improve the quality of care received by veterans, especially with mental health? What do you intend to do about veterans who are denied benefits for a clear diagnosis, whether from a VA facility or otherwise? How do you plan on ensuring veterans that their benefits will not be taken from them once received? What is your plan to fix the overcrowded parking situation at VA facilities? Will he be there to support veterans or [President] Trump? What is his position on privatization and whether or not he supports the Electronic Medical Record started with Dr. Shulkin? Does he honestly feel that he is qualified for the job, or is just flattered to be nominated? How will you change the culture of the VA and the VA Central Office? Will he advocate and fight for what is best for veterans, not what other outside interests want? Will he have 110% support from the President to run the VA as he feels what is right and best for veterans? What makes you uniquely qualified over a civilian physician? What are his plans to convert the VA into a Department that is 100% behind all our Veterans, will immediately take positive action to eliminate the daily suicides of our Veterans, assure immediate medical care for each and every Veteran? What are his plans to turn the VA into a credible, highly functioning Department of Veterans Affairs that takes care of our Veterans? How to help wounded warriors long term? What does Adm Jackson feel he can do to change the VA system to best support all of our Veterans? What experience do you have running a public sector agency? What is the maximum number of employees you have supervised? How he will expedite bringing the VA into the 21st century? How will you engage with the Department of Defense to insure that the commissaries will not be merged with the Exchange Services? Exchanges have been trying to get control of the commissaries for years and they are two very different entities providing radically different support through a radically different set of funding rules. So how do you plan to help the Veterans who need and depend on the commissaries? What are his “for” or “against” privatization of theVA? What are his views on the use of medical cannabis as a treatment for Veterans? How is he going to address problems such as PTSD and Veteran suicides? How can you INSURE that the veterans YOU serve will receive the respectful care and services that they deserve? What experience, insights and ideas do you bring to this job that will elevate care and solve problems beyond current limitations? If confirmed, what kind of leadership team would he put in place to lead the VA? Would he rely solely on a political appointment process in assembling the VA leadership? If he would consider realigning the rating system for disability compensation it is a very unfair calculator. How will he improve the VA? What makes him so sure he is right for the job? Will he not push for privatization? Will you listen to the various the vet organizations for their concerns rather than political appointees pushing their own agenda? How is he going to support veterans physical and mental health issues through the VA? Is he planning to make any changes to women veterans healthcare at the VA? If yes, what are those changes? What experiences have prepared you to lead this department of more than 300,000 employees with an annual budget of nearly $200 billion? What makes him the best candidate? The future of VA health care and what his major goals are to ensure VA’s ability to provide timely, quality medical care to enrolled vets? Do you or would you support the use of cannabis in the medical treatment, use and research in meeting the needs of our veterans? What is the Rear Admiral’s plan for combating the shortage mental health professionals in the VA and lowering the suicide rates? What are his three short term reform goals of the VA? What are your ideas for reforming the VA system without privatizing it? hat qualifies you to become the Sec. of Veterans Affairs? Why should you be confirmed as the VA Secretary? 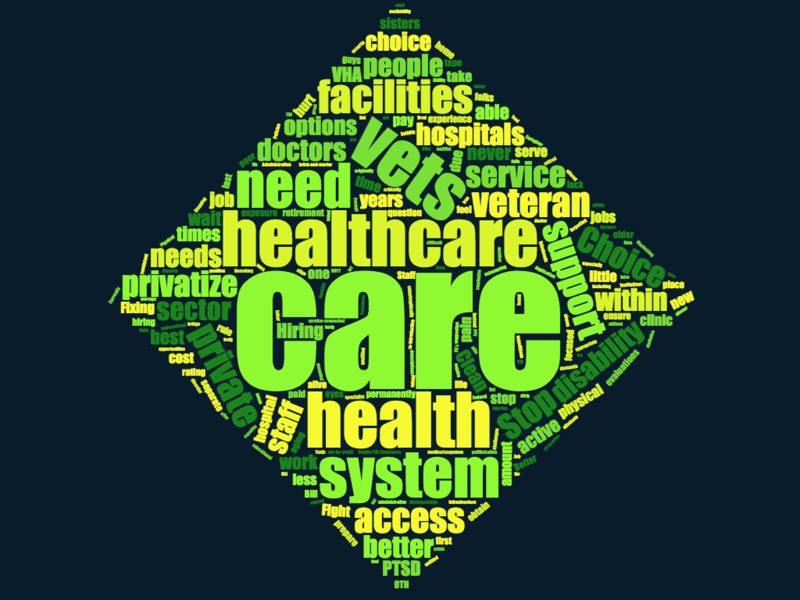 How do you plan to correct the poor treatment and waste within the VA healthcare system? Will he continue to fund the Choice program or will he try alternate methods to increase appointment availability at the VA, like having clinics open on the weekend? If he opposes privation of VA medical services or supports same? What is your position on privatizing the VA? How do you the personal doctor to President Trump plan on discharging the duties of Secretary of Veterans Affairs? Do you plan on improving existing programs? Do you plan on utilizing current VA staff in revitalization, reorganization? Or do you plan on bringing in new staff? There are some real gems that dedicate their lives to Veterans and work with the VA. It is a shame that they are never adequately recognized, utilized, heard or respected would you make an effort to change that? Can you involve Veterans in the running of the VA by implement VA Consumer Oversight Committee’s to implement and benchmark success or failures within VA programs? What about full dental healthcare for all veterans ? How he is going to get the VA to stay focused on treating veterans and telling the VA employees that if it wasn’t for veterans, they wouldn’t have a job? What is the greatest issue currently facing the VA and what is your plan to deal with it? How does he see veteran support from the VA? Restricted or Limited? Will you be able to separate out the politics of the job and do what is in the best interest of each and every veteran? How will he support health care for veterans? Which is more important to him the VA or the veterans it serves? Do you support privatization of VA health care? Do you know the outcomes of VA healthcare compared to the private sector? What are the major issues for Deployed/ Combat veterans? Should the VA be open to all veterans including category 8? What experience does he have in running a large organization such as the VA? What health care operations experience does he have? What experience does he have in improving customer experience and changing an organization into a high performing one? What does he see as some of the root causes that has led to VA being on the high risk list and can he provide ideas of solutions that he thinks can help address the root causes? What are his thoughts on privatization and his confidence that the private industry can meet the needs of Veterans as well or better than the VA has done? Do you support proactive support for veterans who want access to medical cannabis? Do you promise to not close VA clinics or VA hospitals? How does he feel that his experience has qualified him to lead the VA? What specific relevant experience do you have in establishing policy for, and leading, a huge government agency? What make you think you can lead and manage this department? How does he plan to deal with employees not performing their jobs, how many chances? Will elimination of bonuses be on the table? What consequences will there be for individuals that cannot perform or refuse to perform? Can you make decisions for the greater good which could be outside the box? What’s your plan? How does he plan to improve VA services for veterans in rural areas without convenient access to VA facilities. Will you say no to any privatization of the VA? What example will you set for your 375,000+ employees? What makes you qualified? List your experience and qualifications which makes you the best fit for this job. What are you going to do the clean up the corruption in the VA? What is his SPECIFIC plan. Not some vagary without specifics. I’d like to see some passion for taking care of Vets. Are you willing to stand up to [President] Trump? Will you use the VA? How he will fix the management issues that VA is going through currently? VA health care workers provide excellent care to our veterans. The management of VA needs to provide excellent service in support of them and the veterans. Empower employees to bring true changes needed. How will he accomplish this? How will he make sure our Veterans/Military get the best care possible? How is he qualified to begin to reform and address the needs of veterans? What management experiences does he have to run Department of Veterans Affairs? Why does he think he is qualified for this position? What makes you qualified to run the second-largest agency in the U.S. Government? What will you do to improve the VA for veteran healthcare? How do you plan to protect the VA from privatization? What are the steps you plan to take to modernize the care and maintenance of veteran records maintained by the Department of Veteran Affairs? Veterans with untreated/undiagnosed PTSD and TBI are vulnerable to incarceration. Once incarcerated, the VA does little to diagnose/ PTSD and nothing to treat. The VA does nothing for TBI. Both are vulnerable to earning more time due to mood dysregulation. The VA says, they’ll help them when they get out. I’ve seen many Vietnam era vets with 40+ years of prison time and current conflict vets heading same way. What is VA going to do? What are his goals with the VA? Treat with care and compassion as well as understanding and skill. Speed up claims process. Evaluate criteria for making decisions in determining severity of disability. What is your view on privatization? *Questions will be added throughout the day on 4/24/18. Questions were lightly edited for grammar and spelling. Inappropriate or offensive comments and questions are not included. Methodology: Emails were sent to IAVA members inviting them to participate in IAVA’s survey on Dr. Ronny Jackson’s confirmation hearing. The survey was also made available to members on IAVA’s internal platform: myIAVA. The survey was available from 12 PM on 4/22/18 to 7 AM on 4/24/18. The numbers reported are from 2,266 IAVA veteran and service members who completed the survey. The margin of error for this survey is +/- 2 percentage points at the 95% confidence level. The results represents only data collected from the military and veteran community.